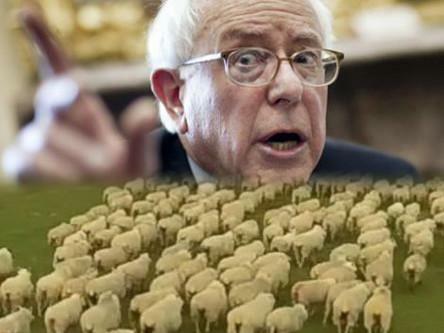 A nasty debate is brewing on the American left over what to do about Bernie Sanders’ campaign for the 2016 Democratic presidential nomination and most of the nastiness is on the anti-Sanders side. Now that Sanders is trending upwards in polls (tripling in Iowa from 5% to 15% and reaching 18% in New Hampshire, two key early primary states) liberals are starting to get hysterical. Articles like “Bernie Sanders Is Already Making It More Likely Republicans Win The White House In 2016” will soon become the norm from this crowd as the primary contest heats up and the Establishment front-runner Hillary Clinton has to defend her Iraq war vote and pro-free trade stance against Sanders’ anti-war, anti-free trade record in six live television debates. The nasty attacks on Sanders from liberals have a curious analog — a mirror image of sorts — on the radical left. Although the reasoning and concerns of liberals and radicals opposed to Sanders differ (as so do the social roots of their politics), both have reached the same defeatist conclusion: Sanders can’t and won’t win, so why bother fighting the inevitable Clinton coronation? The radical left attacks Sanders for running a hopeless race he has no chance of winning — that is, the Democratic primary — while simultaneously attacking him for not running a hopeless race he has no chance of winning — as an independent or Green Party candidate for president in 2016. Think Sanders has a slim chance or that 9/11 wasn’t an inside job? Sheeple! “At that point, with all the alternatives foreclosed, the narrative shifts to the familiar ‘lesser of two evils.’ Every sheepdog candidate surrenders the shreds of his credibility to the Democratic nominee in time for the November election. This is how the Bernie Sanders show ends, as the left-leaning warm-up act for Hillary Clinton. “Intent on avoiding the two-party ‘lesser evil’ trap this year, about two hundred activists gathered in Chicago last weekend to consider the future of electoral organizing outside the Democratic and Republican parties. Many of the participants were Greens, including former presidential and vice presidential candidates Jill Stein and Rosa Clemente, the former Green mayor of Richmond California, and many others. There were also representatives from Seattle, where Socialist Alternative’s Kshama Sawant won election to Seattle’s city council, as well as Angela Walker, a black socialist who received 67,000 votes for Milwaukee County sheriff in 2014, and many others, including some who took part in the recent Chicago mayoral election. The last time the Green Party won 2% of the vote in a presidential race resulted in a political disaster not only for the country but for the Green Party itself. Just look at their numbers since 2000. Dixon can blame these numbers on sheepdogs past all he wants, but in 2012 there was no sheepdog candidate in the Democratic presidential primary herding anyone into supporting Obama’s re-election. If that absence explains why the Green Party’s result tripled from 0.12% of the electorate in 2008 to a whopping 0.37%, then the role played by so-called sheepdog in keeping the Green Party emaciated by starving it of votes and activism is vastly overblown by Dixon and other radical left opponents of Sanders’ 2016 campaign. The real culprit is the spoiler effect. Continually running fringe and spoiler candidates and campaigns does more harm than good to third-party efforts. Precious and meager resources are gathered and wasted on unwinnable fights, campaigners find it impossible to convince people to give their votes to candidates they know can’t and won’t win, and candidates aren’t taken even half-seriously by the constituencies whose support and loyalty they seek to wrest from the Democratic and Republican parties. The end result? The human material for third parties withers away under the weight of cynicism and burnout, the two-party system becomes stronger as third party efforts stall, falter, and fail, and third-party diehards search in vain for hunting for scapegoats called sheepdogs to avoid the difficult work of developing a better, more effective political strategy. This entry was posted in debate and tagged 2016 Democratic presidential primary, Aaron Dix, Bernie Sanders, Black Agenda Report, Bruce Dixon, Democratic Party, Green Party, Jill Stein, liberals, Ralph Nader, spoiler problem, third party politics. Bookmark the permalink. Sanders’ Campaign: Shell Game to Save the Two-Party System or Third Party Breeding Ground? You make good points, but this sentence bothered me “continually running fringe and spoiler candidates and campaigns does more harm than good to third-party efforts.” I disagree. If there are NO efforts then you are basically saying the status quo of the two parties is ok. That’s BS. Of course they won’t win at this time, but having an alternative is better than nothing. Then people won’t be forced to only pick two choices. I’m not advocating “NO efforts,” I’m advocating efforts with either 1) a reasonable chance of victory in a given election cycle or 2) a reasonable chance of victory within a reasonable number of election cycles (more than 2 or 3 I think would probably be unreasonable). The far left has been running fringe/spoiler candidacies for president for the better part of a century — are we any closer to winning than when we started? I think the honest answer is no. Personally, I think no far left organization has any business running presidential candidates for the foreseeable future; that money and effort would be better spent on winnable races for local and maybe state offices. The only reason the old Debs campaigns got what they got is because the Socialist Party at the turn of the century had dozens and dozens of elected officials in state and local governments which made them something of a credible party and able to win votes. You make a good point and I think it may be better to fight for local and state offices first… At the same time, someone should run a candidate in an alternative party for President…like the Green Party. The infrastructure for electoral challenges needs to be built but perhaps in the meantime, other than fighting for local and state offices is to work with communities to build them…I’ve thought for sometime that it might be time to just abandon a focus on elections and just focus on community-building first, but I still think elections have some value even if capitalist candidates with the big money or deceptive “progressivism” win. Can Bernie Sanders Win the 2016 General Election? Should Chicago Unions Have Backed a Socialist Instead of Chuy García? The Constitutional Road to Socialism? Is Kshama Sawant Caving to the Democrats, or Are Democrats Caving to Kshama Sawant? Why Is There No Mass-Based American Socialist Movement?